I’m never more happy than when I’m proudly openly gay and rooting for my home team alongside my father and friends at a baseball game. It’s like my worlds are converging. I just wish closeted Major League Baseball players – and there are many out there – felt the same way. Until the day our gay Jackie Robinson is prepared to brave jeering homophobes in ballpark bleachers across North America, though, I say it’s up to the rest of us to do so. That’s why for years I have called upon Canada’s four most popular professional baseball teams – the Montreal Expos, Edmonton Trappers, Toronto Blue Jays and Vancouver Canadians – to host gay days at their ballparks. I always thought the first ball club to do so would be Nos Amours, since the Expos – supposedly playing their last season in Montreal (yet again) – have so little to lose. After all, this is the team that two seasons ago happily welcomed me and a camera crew from the world’s first all-gay sports TV show, The Locker Room, to spend a day with the team at Olympic Stadium – the first time that’s ever happened with any sports franchise. So I was awfully jealous that the Blue Jays beat Montreal to the punch when it announced last month they will host their first-ever Gay & Lesbian Community Day at Skydome on June 25, smack in the middle of Toronto’s Gay Pride week, when the Jays will play – go figure – the Montreal Expos. The Chicago Cubs – who pioneered Gay Day at historic Wrigley Field, which, by the way, is located in the heart of Boystown, the Windy City’s gay district – will host another Gay Day this season, on August 15, as will their cross-town rivals the Chicago White Sox and the Philadelphia Phillies. Last year’s World Series winner the Florida Marlins will host their second annual AIDS Awareness Day this season and the San Francisco Giants will host their 11th annual Until There’s a Cure Day. So what about Nos Amours? The day I heard about the Blue Jays I immediately called Divers/Cité marketing director Paul Girard – who used to handle marketing for the Quebec Major Junior Hockey League – and introduced him to the Montreal Expos, and I am hopeful both parties can set a date for this summer. Of course, in Major League Baseball little goes according to plan. 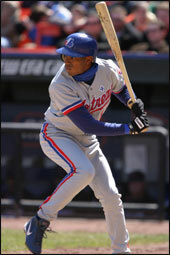 If it did, the Montreal Expos would have moved to another city years ago. Ironically, after MLB overall attendance plummeted in 2002, Montreal Expos attendance actually rose roughly 25 per cent from 642,748 in 2001 to 812,545 the following season. Then when MLB chopped Montreal’s Big O home games from 81 to 59 last year (the remaining “home” games were played in Puerto Rico), Big O attendance climbed even further, to 1,025,639. And they say baseball is dead in this city? Imagine all the new fans the Expos could, um, recruit with a Gay Day or two. And if enough gay fans come out to support their favourite teams across North America, then maybe, just maybe, a gay ballplayer will make that leap of faith and do for gay America what Jackie Robinson did for black America. It’s important to remember Jackie broke pro baseball’s colour barrier with the Montreal Royals in 1946, where he became a local hero and led the team to a Little World Series title before moving on to the big-league Brooklyn Dodgers in 1947. It happened before. It can happen again. And I want to be there the day it happens.